At The Vault, we believe that laws – and attitudes – need to change regarding cannabis. As reform sweeps across a growing number of enlightened territories across the planet (Including a handful of US states and even entire countries, such as Uruguay), it is clear that a sense of positive change is in the air: But whilst we can remain confident that common sense will indeed prevail in the end, it is critical that we help this movement to grow, so that the ultimate end-goal of a safe, legal framework for cannabis use can happen sooner, rather than later: This will ensure that fewer people suffer injustices – and that more people can enjoy the benefits of nature’s miracle herb. Right now, many people across the planet are being denied legal access to a naturally-derived medicine which countless studies have shown could improve (or even help to save) their lives: This absurd, tragic state of affairs needs to end. As you read this post, a huge number of people from all walks of life are having their whole world (And their human rights) ripped to shreds, simply because they have chosen to partake in personal (often medically-focused) cannabis use that has seen them fall foul of outdated laws. We can’t allow this to continue. Cannabis prohibition means that ordinarily law-abiding citizens might find themselves running into dangerous criminals, who will not only rip them off with poor-quality, extortionately-priced, potentially adulterant-filled and dangerously unregulated weed, but who will then use the profits made from their illegal enterprise to fund more nefarious criminal activities: Such criminals may even stoop so low as to sell their products to minors and vulnerable individuals: Again, this needs to stop. What positive changes could be brought about by ending prohibition? People who seek cannabis as a medicine could receive their treatment without fear of prosecution. The quality of legally available cannabis could be controlled, ensuring that consumers will get to know exactly what they are buying. Cannabis could be bought safely from legitimate businesses, eliminating the need for interaction with criminal gangs. Age restrictions could be put in place, to help keep cannabis in the hands (and only in the hands) of responsible adults. We’re passionate supporters of organisations and individuals who seek to peacefully (and legally) help bring about cannabis law reforms. In a world where potentially harmful and addictive substances like alcohol, tobacco and a myriad of potent, side-effect-laden prescription drugs can be procured openly on every street corner (With full government and big-business backing): Why is it that a naturally-derived herb, which has helped humanity for millennia, has been vilified by the powers that be? Ask yourself this question and decide whether or not the people in the upper echelons of power really have your best interests in mind. We endeavour to help the pro-cannabis movement educate people and spread the truth about the myriad of benefits that this natural herb can bring to society. We’re proud to support the pro-cannabis cause! At The Vault, we don’t believe in sitting on the side-lines: We support the global pro-legalisation movement through peaceful, legal activism. We’re proud members of NORML-UK and are actively involved with respected organisations like Medical Marijuana UK and the UKCSC in its activities across Scotland. Put simply, we want to make a difference: And we’ll continue to show these great organisations our full support at every chance we get. NORML-UK is a not-for-profit; nonpartisan organisation which channels its efforts to call for more research into the myriad of benefits that can be gained from cannabis. “NORML UK seeks to gain recognition for the rights of people to peacefully pursue activities relating to cannabis without unwarranted intervention by the authorities”. This non-governmental organisation allows members from the vast network of Cannabis Social Clubs (CSCs) throughout the UK, Europe and the rest of the world to show solidarity and work towards bringing about positive change through peaceful, responsible activism. The UKCSC seeks to spread the truth about cannabis, provide a voice to a growing worldwide cannabis community and to remove the stigma associated with cannabis consumption. This admirable organisation holds local and national meetings, to reach out to members, cannabis consumers and communities who are unfairly discriminated against due to the failed experiment that continues to be perpetuated to this day: Cannabis prohibition. You can find out more about the UKCSC at http://ukcsc.co.uk/ - and if you want to find out where your nearest CSC is, they have a handy list and details available here. Disclaimer: The Vault is committed to supplying our valued customers with finest-quality legal cannabis seeds from the world’s top breeders in a responsible manner. We believe that the public should have access to our produce without having to break any of their local laws, so that top-quality genetics can be legally preserved for more enlightened times. We urge all of our readers to obey their local laws: None of our posts are intended to incite, condone or encourage illegal activities of any kind. All of our content is provided for educational purposes only. 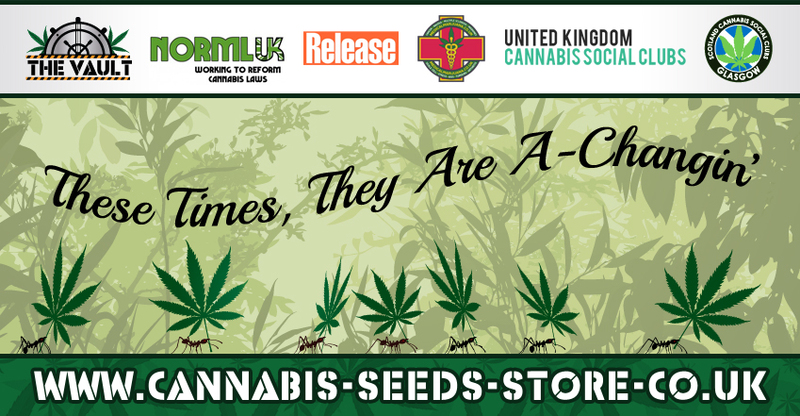 Activism, Community, The Vault Cannabis Seeds Cannabis Seeds, legalisation of cannabis, uk drug reform. permalink. We ship cannabis seeds to all countries worldwide. We will not be held responsible for any legal issues which may result if we send seeds to you.